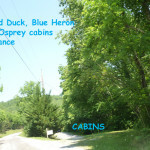 The smaller river cabins–Wood Duck, Blue Heron and Osprey–Unplug! Chill out!! No WiFi! 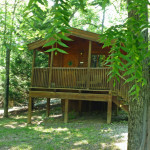 Relax on the banks of the Shenandoah River or jump right in to swim, canoe or tube. The fishing is great–the best small mouth bass fishing in Virginia! Relish in the sounds of the wind in the forest or watch for the wildlife as you hike in the nearby National Forest! 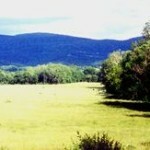 Deer, turkey, eagles and more! Retreat to the front porch to sit and watch the moon rise! 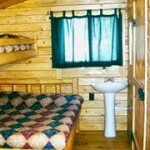 Each cabin has two rooms with a double bed/bunk bed in each room and is set for up to 6 persons. The back room has the shower stall bathroom. The front room has the mini-kitchen area and table and chairs. 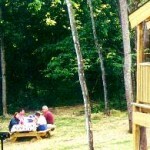 Outside is a picnic table, charcoal grill and fire pit for each cabin. There is a bonfire area down by the river about 100 yards away. We have a lock box on the door of each cabin. When paid in full, you get the code and can go directly to the cabin. 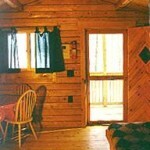 The cabins are ‘pet friendly’ and ‘smoke-free’. 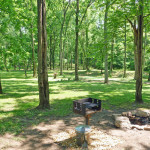 No camping at cabins or at river is allowed. Max. 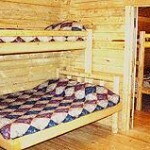 of 6 in each cabin. Each additional person will be charged $100/person/night. 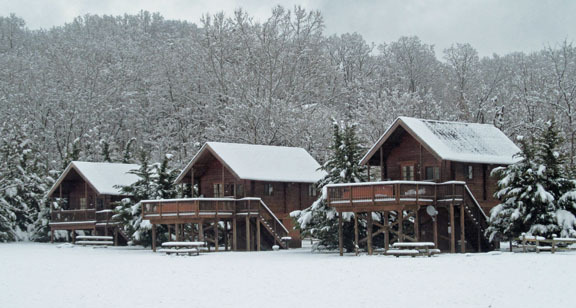 Check the Availability calendars–these cabins are open from mid-March to late Nov but closed in the winter. Please call in to book . 540-743-4159 between 9 & 5 even in the winter. 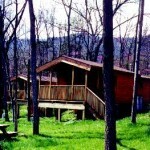 Deposit is refundable up to two weeks in advance. If canceled within last 14 days, 1/2 of full payment refunded. If canceled in last 7 days, no refund. 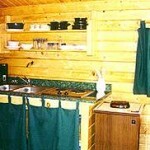 No camping at Bella Vista cottage or the River cabins. Directions to the River Log Cabins and the Bella Vista cottage.